Happy December! The holidays are so close and we hope you are having a peaceful holiday season. An eventful year is drawing to a close and it is going out with several bangs 😀 Cassandra Clare sent another newsletter to conclude the year and TMI Source also has something special planned. More on our plans on the 24th, though. Cassie’s newsletter was a really special one this time because we were treated to lots of awesome stuff – photos from her recent trip to New Zealand, another Reginald photo, new fairytale/Shadowhunter Mashup series art (Sizzy ♥) and an exclusive Queen of Air and Darkness snippet! Since this was an exclusive snippet for Cassie’s subscribers, we once again waited a little while before sharing it with our readers. “You never know,” Emma said. She stopped when she saw Mark, and she and Mark stared at each other in a way that made Emma feel as if she had disappeared completely. “I didn’t mean to interrupt,” Cristina said, but she was still looking at Mark, and he was looking back as if their gazes were hopelessly tied together. Mark had shaken himself, as if he were casting off cobwebs or dreams. “It is all right — I must go speak with Drusilla.” He had bounded up the stairs and out of sight, disappearing around the bend in the corridor. Cristina had snapped out of it and invited Emma in, and now it was as if the moment with Mark had never happened, though Emma was itching to ask about it. “Mark will need you,” she said again, and Cristina twisted her hands in her lap. Cristina dropped her face into her hands. “Mrfuffhfhsh,” she said. Though the Scholomance is cold, and Diego is boring, I am still grateful that you found enough value in my life to save it. You are as kind as you are beautiful. My thoughts are with you. “When it comes to faeries,” Emma said darkly, “everything means something. 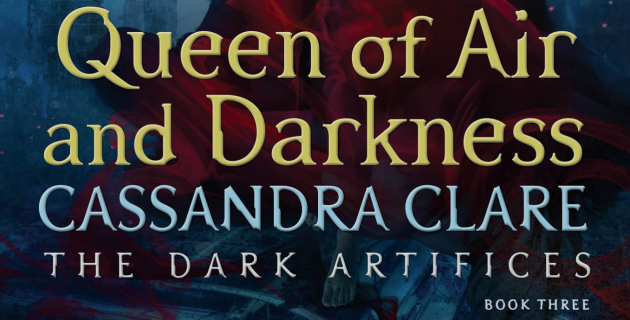 Queen of Air and Darkness is published on December 4, 2018 – less than a year now, guys! You can also read Cassie’s newsletter here and have a look at the past issues. What do you think of Cassie’s latest newsletter, especially the new snippet? Sound off in the comments below!